Shares in Lufthansa slid 3.1% yesterday, while SAS dipped 1.0%, as the German carrier reached an agreement to acquire the remaining shares in the UK’s bmi. The Frankfurt DAX closed sharply lower (-2.13%) yesterday. Lufthansa announced yesterday that, with effect from 01-Nov-2009, Lufthansa-related UK holding company LHBD Holding Ltd (which has held an 80% stake in bmi since 01-Jul-2009 and in which Lufthansa holds a 35% stake) will take over a further 20% stake in British Midland PLC (bmi). The shares are currently held by the SAS Group and with the transaction LHBD will hold 100% in bmi. After obtaining the necessary traffic rights, Lufthansa expects to be able to acquire 100% of LHBD. See related report: Lufthansa's bmi sale raises unique opportunities and complexities. Who are the 12 potential bidders? Under the terms of the agreement, LHBD will acquire the 20% stake for approximately GBP19 million, with Lufthansa paying SAS another GBP19 million for the cancellation of its rights resulting from the shareholder agreement dated 1999. Should Lufthansa decide, on the background of its strategic analysis, to sell bmi completely or parts of the company, SAS will, under certain conditions, receive an additional payment, within the next two years. British Airways CEO, Willie Walsh, yesterday confirmed the carrier’s interest in bmi. bmi is the second largest holder of slots at London Heathrow International Airport (11.5%), behind British Airways, which holds 41% of Heathrow slots. Mr Walsh stated, "although I'm not going to signal what I'm willing to pay for it, [we] could make Lufthansa a very credible offer to acquire it”. Meanwhile, Iberia executives are expected to meet with the Board of BA today, regarding further talks on a possible tie up. BA previously indicated a merger deal with Iberia may be completed by the end of this year. Shares in Iberia jumped 1.3% yesterday. 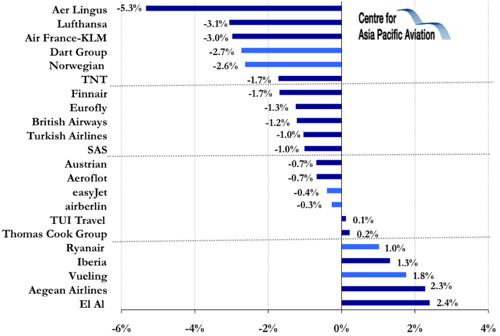 Elsewhere, shares in Austrian (-0.7%), Finnair (-1.7%), Air France-KLM (-3.1%) and Aer Lingus (-5.3%) dropped.